Come join us in being a part of our spring nail art tutorial. We will be showing you how to achieve easy, beautiful spring inspired nail designs that are sure to brighten your day. 1. Apply base coat to nail plate followed by 2 coats of white polish. 2. Using a make up sponge, apply your 2 desired nail colors vertically along the base of the sponge. 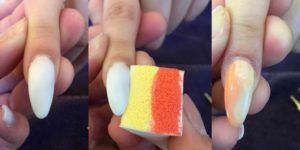 Slowly rock the sponge over the nail plate and gently tap to further blend. 3. Clean any excess polish with nail polish remover and a cotton tipped wooden pusher. Finish with top coat. 1. Apply base coat to nail plate. Using 2 colors of polish, paint half the nail vertically with one color and the other half a different color. 2. While polish is still wet, take your toothpick or needle (we used a needle) start at the base of your nail, working down to the free edge, create small swirls without breaking contact. 2. Using your desired polish color for the flower create small circles using a dotting tool. 3. Gently use a needle to pull across the circles to create petals. 4. Clean any excess polish with nail polish remover and a cotton tipped wooden pusher. Finish with top coat. 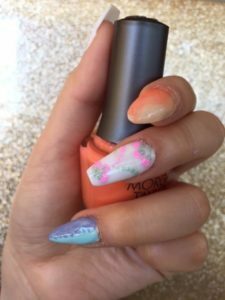 With these easy techniques, you can achieve a beautiful spring nail design at home that will get you ready to jump into the spring season, nails first! 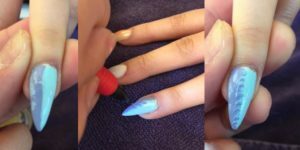 This blog was written and executed by Appleton nail students Hieu and Alica.